Narrow and very narrow aisle storage systems should strike a balance of costs and productivity, even as new solutions expand what’s possible in a limited amount of space. When it comes to storage density and cube utilization, more is good. When you look at the people to access and manage the space, the fewer the better. Narrow aisle and very narrow aisle (VNA) configurations can meet a sweet spot between the two, but such a transition is not as simple as compressing space and equipment. According to Perry Ardito, general manager of warehouse products for Mitsubishi Caterpillar Forklift America, a series of trade-offs must be carefully measured to ensure the success of a narrow or VNA storage system. 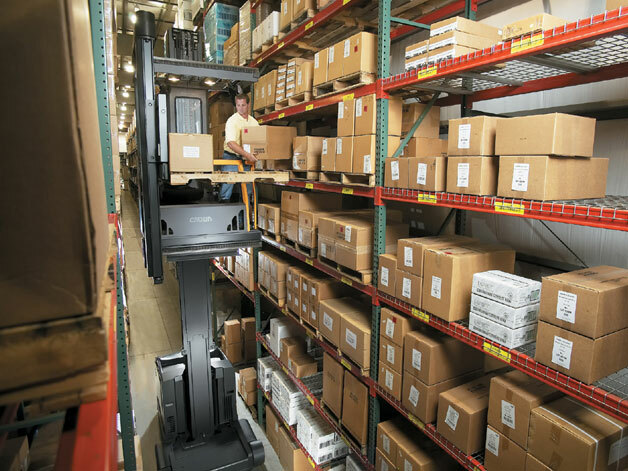 SKU and labor pressures compel facilities toward the types of precision and efficiency that are baked into narrow aisle systems and the lift trucks within them. However, that specificity is also one of the biggest potential pitfalls. Narrow and VNA equipment is very specific to the size of the aisle, whether a turret truck in a 5- to 6-foot-wide VNA aisle or reach trucks in a 9- to 9.5-foot aisle. The key trade-off is the increased productivity of a turret truck, which Ardito says could be double that of a reach truck, can result in overall fewer trucks and operators. And, since the operator is only required to move forward, backward and vertically, they don’t have to turn into a location, reducing opportunities for damage to product or racking. On the other hand, because turrets are often dedicated to putaways and picks in a specific aisle, they will not necessarily have the versatility to perform tasks elsewhere. However, Ardito has already seen creative combinations of technology that emphasize the strengths of each component. Whether segmented by SKU or by movement, there might be a mix of high-density storage, selective storage, automation or less-than-full-case picking, he says. “I have seen turrets working in VNA alongside a multi-level pick module, incorporating multiple technologies in the same building,” Ardito says. “What’s very likely is a stronger push toward semi-automation and full automation driven by cost awareness, specifically the cost of labor.